The New Teaser Trailer for Darren Lynn Bousman’s Supernatural Thriller '11-11-11'! Big Air Studios have released a new teaser trailer for Darren Lynn Bousman’s [Saw II, III] upcoming horror 11-11-11. The thriller stars Michael Landes, Wendy Glenn & Timothy Gibbs. The numeric reference specifies a date, '11-11-11' on which an entity from another world enters earth for 49 minutes through Heaven’s 11th gate. The same date of the movies release, November 11th, 2011. Hit the jump for the trailer & details. Synopsis: After the tragic death of his wife and child, famed American author Joseph Crone travels from the United States to Barcelona, Spain, to reunite with his estranged brother, Samuel, and dying father, Richard. However, fate has a different plan for Joseph as his life becomes plagued with strange happenings and the constant sightings of the number 11. Curiosity quickly turns to obsession, and Joseph soon realizes that this number holds a horrific meaning not only to himself but possibly to all of religion. Isolated in a foreign country with only the support of his companion, Sadie, Joseph soon realizes that 11/11/11 is more than just a date; it’s a WARNING! 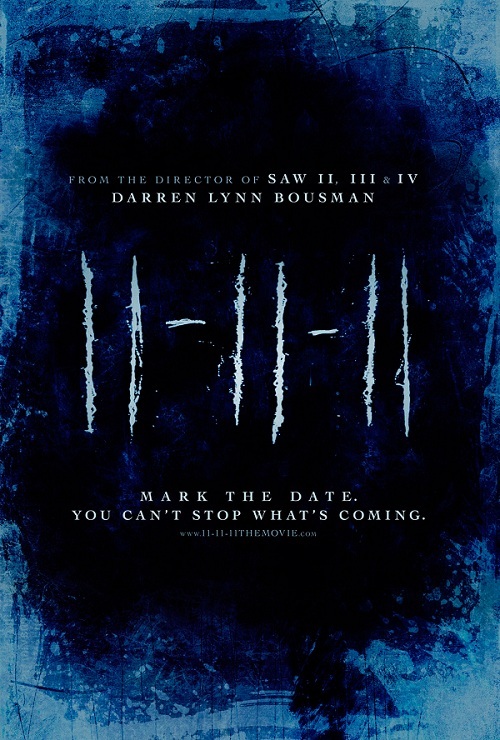 I'm reading: The New Teaser Trailer for Darren Lynn Bousman’s Supernatural Thriller '11-11-11'!Tweet this!